educate people on the complex issues surrounding end-of-life (EOL) care under Jewish law, so that people can make the right decisions for their families. The attendees learned about how Calvary provided excellent care for renowned Rabbi Zelig Lieb Taussig in 2015. The program featured presentations by Rabbi Elchonon Zohn, founder of NASCK; Rabbi Mordechai Willig, Rosh Yeshiva, Yeshiva University; and three physicians from Calvary — Michael J. Brescia, Christopher C. Comfort and Alma Carrington. The event attracted rabbis, lay people and students from throughout the greater New York area. Attendees came from Congregation Beth Sholom Chabad, Congregation Machane Chodosh, Congregation Etz Chaim, New York-Presbyterian/Queens, Young Israel of Riverdale, and Young Israel of Woodmere. The attendees learned about the Hospital’s 117-year history of caring for Jewish patients, taught by Michael J. Brescia, MD, executive medical director. Three Rabbis care for hundreds of Jewish inpatients and home hospice patients at Calvary each year. In addition to kosher food upon request, Jewish inpatients and their families can expect a daily visit from a rabbi, food from an expanded Kosher Hospitality Room, dedicated Shabbos Lounge, Kabbalat Shabbat service, and celebrations of all major holidays. Calvary Hospital is part of the Pelham Parkway eruv. 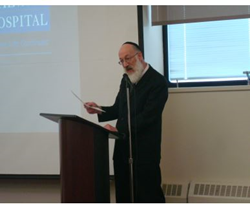 The Hospital’s outreach to the Jewish community, and the Torah Restoration, has been spearheaded by Dr. Brescia. The National Association of Chevra Kadisha (NASCK) was founded in 1996 in order to form a united and cohesive group of Jewish Burial Societies in the United States and Canada, dedicated to promoting awareness of traditional Jewish end-of-life decisions and burial practices. It acts as an umbrella organization to assist affiliated groups in defining, establishing, and achieving the highest degree of respect for life and Kovod Hames as defined by Jewish law. For more than a century, Calvary Hospital has been the nation’s only fully-accredited, acute care specialty hospital devoted exclusively to providing palliative care to adult patients with advanced cancer and other life-limiting illnesses. More than 5,800 patients are cared for annually by Calvary’s inpatient, outpatient, home care, hospice, and wound care services. Inpatient care is offered at our 200-bed facility in the Bronx and our 25-bed Brooklyn Satellite at Lutheran Medical Center. Calvary Hospice provides short-term inpatient care at The Dawn Greene Hospice, located at Mary Manning Walsh Home in Manhattan. To learn more or sign up for the e-newsletter, Calvary Life, please go to http://www.calvaryhospital.org.